Sony has filed to patent a futuristic technology that will show multiple people different images through the same screen at the same time. 3D televisions may be useful for more than increased depth perception or a new visual experience in gaming and movies. Patents filed by Sony detail a system through which those wearing 3D-style glasses and watching a 3DTV can play multiplayer games together with different images shown to each player. 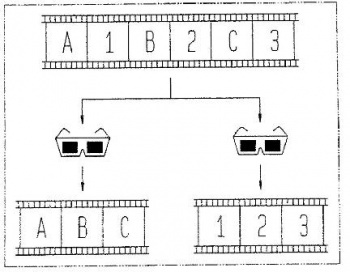 The term used for the technique is called stereoscopic screen sharing. It translates different images to different viewers of the same television filtered through shuttered glasses. It was easy to cheat in GoldenEye 007 multiplayer on the N64 by looking right over at your friends' screens. Stereoscopic screen sharing would change all that. The patent was filed with many different images that show the types of uses this technology could have for even more than gaming. Let's say mother wants to watch American Idol, but little Jimmy and his friend Bobby are in the middle of playing Killzone 3. This screen sharing method could enable both of the children to massacre each other while Jimmy's mother votes for the nation's next pop star. The idea is quite compelling and adds to the reasons that one might buy a 3D television. Though it seems like the issue of sound would have to be worked out too (probably through multiple headphone sets), relationships everywhere could be saved by this technology. The unwilling may never have to watch Glee again.